It is hardly news when partygoers end up in the emergency room from an overdose of methylenedioxymethamphetamine (MDMA), aka ecstasy (and a whole bunch of other names, such as Molly, E, X, many others). Rather than simply report on another recent case at a music festival in California, in which ecstasy may have been the cause of two deaths, we thought it might be more interesting to explain what ecstasy really is, and debunk the myths that surround it. 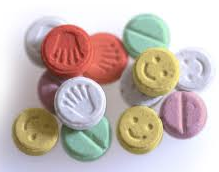 Ecstasy gets a clean bill of health when compared to other recreational drugs. It is considered to be natural and safe. In reality, it is neither. Even if you are not a scientist, a brief look at the structure of the drug is quite instructive. 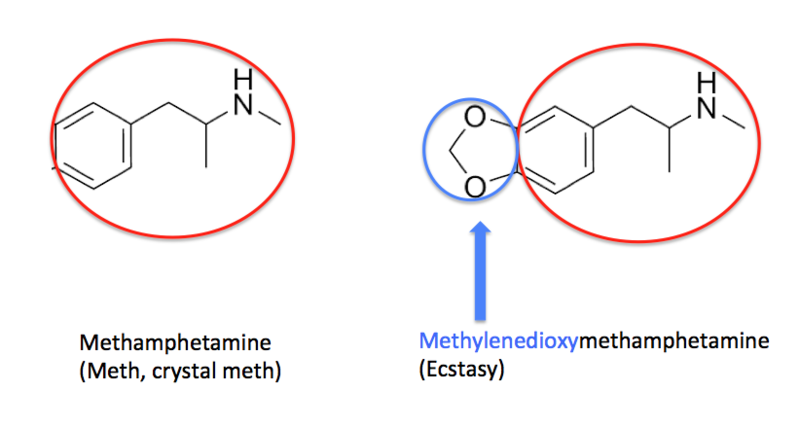 With the exception of the methylenedioxy group (blue), ecstasy is identical to crystal meth, so it is not surprising that it has similar neurological effects. But, the methylenedioxy group adds a few more. It gives the drug hallucinatory properties. No sane person would argue that methamphetamine is natural or safe. It is neither. It was first synthesized in the 19th century, and has created nothing short of a plague in the U.S., especially in America s heartland. Almost five percent of Americans have tried the drug, which is highly addictive. The National Institute on Drug Abuse says, Both the rush and the high are believed to result from the release of very high levels of the neurotransmitter dopamine into areas of the brain that regulate feelings of pleasure. Long-term meth use results in many damaging effects, including addiction. Chronic meth abusers exhibit violent behavior, anxiety, confusion, insomnia, and psychotic features, including paranoia, aggression, visual and auditory hallucinations, mood disturbances, and delusions such as the sensation of insects creeping on or under the skin. Methamphetamine can also cause a rise in body temperature. The same holds true for MDMA, but this effect can be disguised due to the hallucinatory effects and feeling of goodness. Overheating is the most common cause of emergency room visits and death in ecstasy users, especially during raves, where the room may already be hot, and the drug provides the illusion that users have the energy to keep dancing all night. There is no good answer for the drug abuse crisis that is sweeping the nation. Meth can be instantly addictive, and has destroyed many lives. Opioid abuse (Percocet and Vicodin, mostly) has become a nationwide crisis, and attempts to limit access to these narcotics has led to a spike in heroin use, which in addition to overdose deaths, has become a major contributory factor to the spread of HIV and hepatitis C.
There may be no effective way to control the use of ecstasy, but at the very least, users should be aware that the drug is not safe, healthy, or natural. That is pure hype.